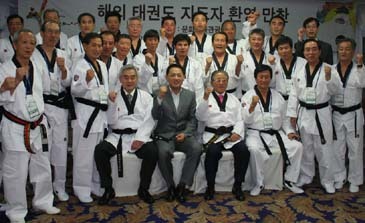 WTF President Chungwon Choue poses with Korean Minister of Culture, Sports and Tourism Yu In-chon (center) and other dignitaries, all in taekwondo uniforms, during the ceremony to mark the 2008 Taekwondo Day at the Olympic Park in Seoul, Korea, on September 4, 2008. A total of 7,000 people gathered from at home and abroad to observe the Taekwondo Day. The 2008 Taekwondo Day was observed in a ceremony at the Olympic Park in Seoul, Korea on Sept. 4, 2008, drawing about 7,000 people from at home and abroad. Under the theme "One World Through Taekwondo," the 2008 Taekwondo Day, the third of its kind, was jointly organized by the World Taekwondo Federation, the Kukkiwon, the Taekwondo Promotion Foundation and the Korean Taekwondo Association, along with the Korean Government. To mark the day when the IOC voted to include taekwondo in the official program of the Olympic Games, the WTF designated Sept. 4 as Taekwondo Day at its General Assembly in July 2006 in Ho Chi Minh City, Vietnam. The inaugural Taekwondo Day was celebrated on Sept. 4, 2006 during the opening ceremony of the 1st WTF World Taekwondo Poomsae Championships in Seoul. To mark the 2nd Taekwondo Day, which fell on Sept. 4, 2007, the WTF posted its official taekwondo anthem on its Web site for global promotion. Among the attendees at the commemorative event were Mr. Yu In-chon, Korean minister of culture, sports and tourism; several parliamentarians; WTF President Chungwon Choue; KTA President Hong Joon-pyo; and TPF President Dai-soon Lee. Also present was Mr. Moon Dae-Sung, the 2004 Athens gold medalist, who became a member of the IOC during the Beijing Olympic Games. Almost all the participants wore taekwondo uniforms. The event featured various cultural programs like a concert and taekwondo demonstrations. Minister Yu announced a set of taekwondo-promotion programs, showing his strong will to further develop taekwondo as a global cultural asset representing Korea. As a token of the Korean government's appreciation, Minister Yu also presented plaques of appreciation to about 40 taekwondo masters living abroad. "My strong conviction is that taekwondo's inclusion in the Olympic Games and retaining its Olympic status have been mainly attributable to the global taekwondo family members, especially those who went abroad in the 1950s and 1960s to teach taekwondo," said WTF President Choue in his congratulatory remarks. WTF President Choue painted a bright of taekwondo by mentioning that a total of 22 countries won at least one medal in the taekwondo competition at the 2008 Beijing Olympic Games, reflecting the universality of taekwondo. A total of 128 athletes from a record 64 countries took part in the Olympic taekwondo.